The finest architecture in Milan is concentrated in its Centro Storico (prime area). Milan's historical centre is unfortunately not very large, as many buildings were destroyed during World War II. The architecture of Centro Storico is primarily fin de siecle in style, featuring elegant facades. Some buildings come with lovely courtyards, occasionally with gardens or fountains. It is a charming area, though not ideal for families. Rental rates in Centro Storico are very expensive. The most expensive properties are concentrated in the Castello, Palestro, Manzoni, and Quadrilatero areas. These places house grand early 20th-century buildings catering to noble and affluent Milanese families. Luxury shops abound, particularly in the Quadrilatero d'Oro. Piazza Duomo serves as the hub of the historic district; from the piazza you can easily orient yourself to the major landmarks and central neighbourhoods. At the piazza itself stands the Duomo, or Milan Cathedral, a striking International Gothic structure that took several centuries to be completed. To the northwest of the piazza is the Castello Sforzesco, the 15th-century castle that was built for the Duke of Milan, Francesco Sforza, and served as the residence of the eminent Sforza Dynasty. The castle sits just north of the upscale neighbourhood Magenta that surrounds the avenue Corso Magenta. Northeast of the piazza, past the Quadrilatero, is the Via Palestro, where you will find the Villa Reale and its enchanting gardens. The late 18th-century villa, built in Italian Neo-Classical style, was at one time a residence for Napoleon. Its gardens are a popular venue for summer concerts and operas. This district flanks the Corso Magenta leading to the centre of historic Milan. 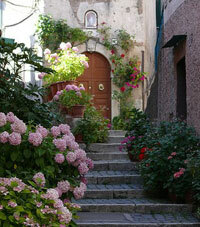 It is a wealthy district, its residential parts have lovely palazzi adorned with gardens. Elsewhere in Magenta you will find many fine shops, restaurants and cafes. Public transportation is excellent. During the day, Magenta can be very busy and congested. At night, however, it is quite peaceful. A short walk away from Corso Magenta is the Church and Convent of Santa Maria delle Grazie, where you can find Leonardo da Vinci's The Last Supper, the pinnacle of Milan's art treasures. Quadrilatero d'Oro is northeast of Piazza Duomo, its area defined by these four streets: Via della Spiga, Via Sant'Andrea, Via Alessandro, and Via Montenapoleone. In a city that prides itself on being the Fashion Capital of Italy, Quadrilatero d'Oro stands out as the apex of fashion; indeed, it is also known as Quadrilatero della Moda. This elegant area is the territory of Dolce & Gabbana, Prada, Versace, Valentino, Armani, Bulgari, Gucci, and other high-end boutiques. A walk through the streets of "the golden quad" will easily conjure scenes ripped from the photo pages of Vogue Magazine. The most famous street in the quad is Via Montenapoleone, the city's premiere address for fashion and jewelry stores. It is comparable to other world-famous streets including 5th Ave in New York City, Avenue Montaigne and Rue du Faubourg Saint-Honoré in Paris, and other famous Italian avenues such as Via dei Tornabuoni in Florence and Via Condotti in Rome. Another esteemed shopping street, Via della Spiga, offers yet more luxury stores, while less expensive merchandise can be found on Via Sant'Andrea. Only a few residential properties can be found in Quadrilatero d'Oro, and those few are very pricey and exclusive. Brera is just west of Quadrilatero d'Oro and north of Piazza Duomo. Until recently, Brera was much like Montmartre in Paris: a quaint little district with a strongly bohemian vibe. The Brera of today is still an appealing place with old cobbled streets and antique palazzi. But there are fewer traditional artisan workshops now; they have mostly given way to contemporary designer boutiques, sleek bars, and chic lounges. Still, you just might run into a palm reader while going on your way along the Vicolo Fiori. The neighbourhood takes its name from the Palazzo Brera, built by the Spaniards in the 16th century. 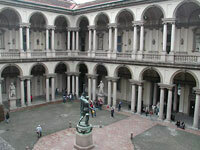 Originally a Jesuit college, the building is now the site of the Brera Art Gallery (Pinacoteca di Brera), which exhibits many priceless Italian Renaissance and Baroque paintings. Brera is a true highlight in Milan: a pretty and relaxing place, with more breathing space and less bustle than nearby Montenapoleone. It is a short walk north of Piazza Duomo and La Scala opera house. Apartments of all sizes can be found in Brera, but they tend to be very expensive, though quite luxurious and, in general, more spacious than typical apartments. Northwest of the Piazza Duomo is this spacious and elegant neighbourhood along the wide, tree-lined Corso Sempione. Its residential buildings are characteristically luxurious, marked by tall windows and elegant balconies. The neighbourhood overlooks the largest park in Milan, the Parco Sempione beside Castello Sforzesco. The entrance to the park is defined by the Arco della Pace, a classical triumphal arch reminiscent of l'Arc de Triomphe in Paris. 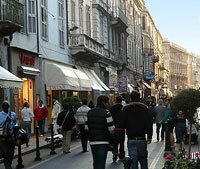 The side streets that adjoin Corso Sempione are packed with high-end boutiques, restaurants, and bars. The streets buzz with activity during Milan's "Aperitivo Hour" that actually stretches from about 6 to 9 PM. 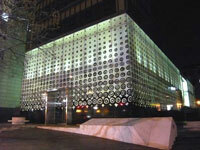 Corso Como is north of Piazza Duomo and Brera, on the outskirts of the city centre. It is a bustling, multi-faceted neighbourhood exhibiting a wide variety of architectural styles, from fin de siecle buildings to modern apartment rises. The boulevard of Corso Como itself is a pedestrian-only street lined with classy restaurants, nightclubs, and boutiques, among which the most famous is 10 Corso Como, a pricey fashion emporium owned by former Vogue editor Carla Sozzani. Corso Como is very popular among wealthy partygoers. At night, its clubs and bars are packed with posh, well-dressed people from Milan's top fashion and business circles; you may even rub shoulders with Milan's top models and celebrity footballers, especially Sunday nights. By day, you will find lively street markets as well as style-conscious shoppers coming over from nearby Brera. Corso Como leads a short distance north to the Porta Garibaldi arch and the railway station named after it.